By: Ira Wolfman; foreword by Alex Haley; Illustrations by Michael Klein. Trees? (121,000 copies in print), the Internet has completely transformed genealogy, making family history the second most popular hobby in the U.S. after gardening and genealogy the second most searched for subject on the Web. 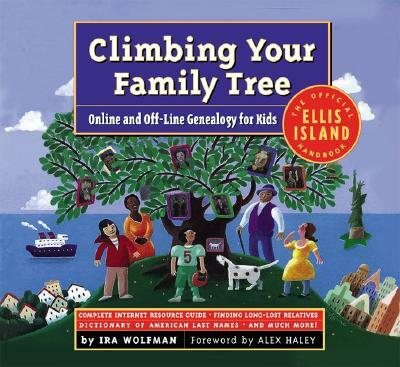 Now completely revised, updated, retitled, and filled with detailed guidance on utilizing the Internet, Climbing Your Family Tree is the comprehensive, kid-friendly genealogical primer for the 21st century, and a dramatic story of how and why our ancestors undertook the arduous voyages of immigration to this nation. It teaches kids to track down important family documents, including ships' manifests, naturalization papers, and birth, marriage, and death certificates; create oral histories; make scrapbooks of photos, sayings, and legends; and compile a family tree. A full chapter is devoted to the online search, and relevant Internet information has been incorporated into all the other chapters. Also new are more kids' genealogical stories and a reworked, easier-to-use design, and supporting the book will be a Web site that will include record-keeping pages, links to sites in the book, and more. Author: Ira Wolfman; foreword by Alex Haley; Illustrations by Michael Klein. Description: In the ten years since the publication of Do People Grow on Family Trees? (121,000 copies in print), the Internet has completely transformed genealogy, making family history the second most popular hobby in the U.S. after gardening and genealogy the second most searched for subject on the Web. Ira Wolfman, the former editor-in-chief of Sesame Street Magazine, is a writer whose articles have appeared in Travel + Leisure, Redbook, Ms., and other publications. He is also the author of Climbing Your Family Tree.